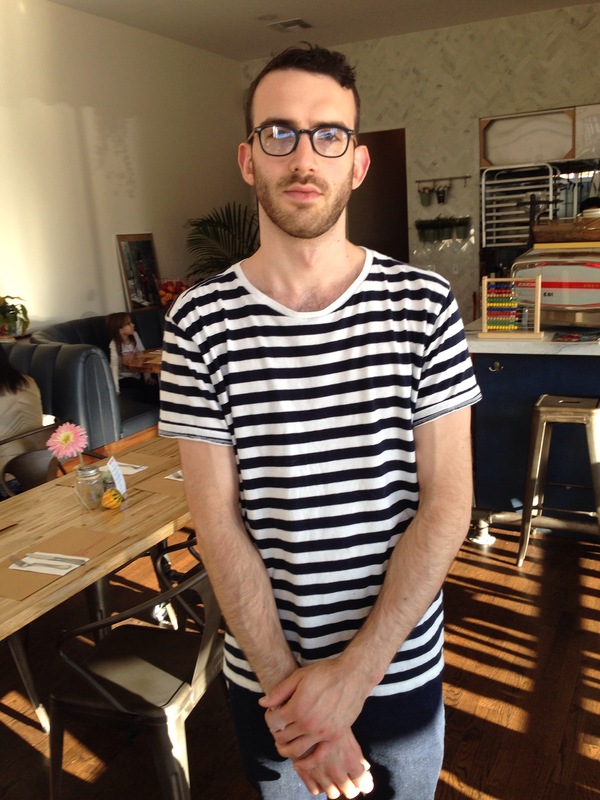 I asked another person if I could take their picture: Ross at The Corner, a cute little breakfast/brunch spot here in Montclair. Ross is a server there and is very tall and cute with a prominent Adam’s apple (I didn’t get that in the drawing). After I painted in the stripes I decided to have that the only color and the rest black ink. I kind of like the look of it. 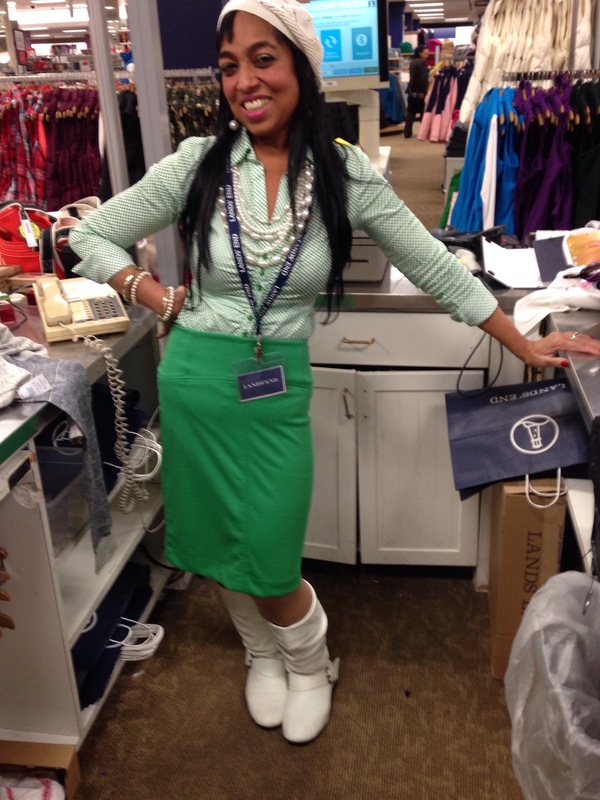 Returning something last night at the Landsend department at Sear and came across this lady vibrantly dressed and with a great attitude. I asked her (trying not to be creepy) if I could take her picture. She posed wonderfully for me! Did this little sketch before work because I wanted to use paint. She told us she works every day but Sunday “Sunday is for church”. She works so hard and yet was so lovely, well dressed and a joyous feeling about her. Way to go, sweet lady! My first drawing of a baseball player in honor of Kerfe, a Mets fan. I think this is a sketch of Jeurys Familia; Kerfe please correct me if I’m wrong. Very happy about the Mets even though I’m not a big sports fan! I know I started working on this mask well before Nina and I started this blog, so it’s been at least two years. As usual, I wildly underestimated the time it would take me to do it, especially the beading. This summer I vowed to finish it for Halloween. Just under the wire! 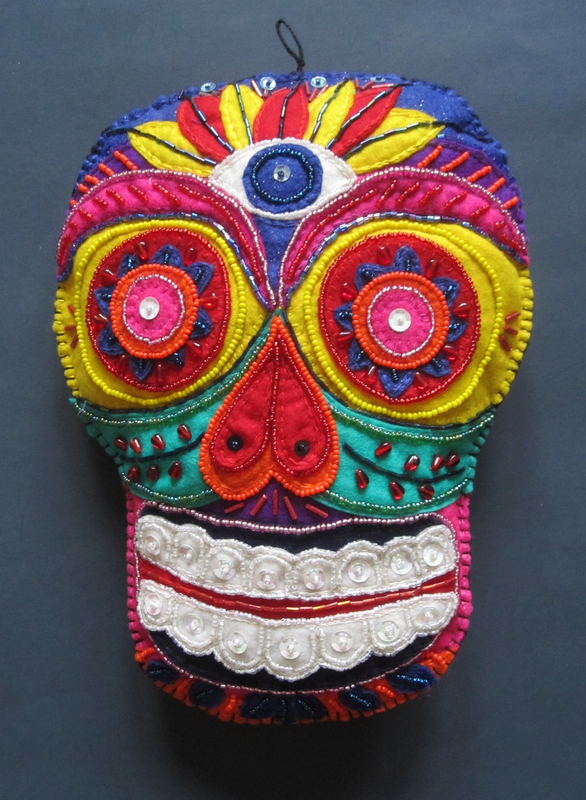 The idea comes from Day of the Dead skulls, which can be quite colorful and elaborate. I sewed layers of felt on a felt backing, embroidered and beaded the face, and then backed and lightly stuffed it with a loop for hanging. And I have been working on the real “unfinished project #3“, also a mask. However, the answer to the question, “Can I finish by the end of the summer?”, the last sentence in that post, is: in a word, no. But I’ll be positive. I have completed 4 unfinished projects so far this year. I do not realistically expect to finish the 5th one before 2016 though. In the meantime, I have houseguests, and will be offline for awhile. Happy Halloween, hope to be back by “Draw a Bird Day”, (November 8), will catch up with the blogworld then. A view of NYC from the top of Eagle Rock Reservation. This is the site of the 9/11/01 Memorial where the names of Essex County residents killed in the attacks are listed on a plaque. It is beautiful up there any time but especially at sunset. …to both Halloween and many ecosystems. They keep insects under control, pollinate plants, and disperse seeds. Seventy-five species of bats are endangered or critically endangered due to the usual: loss of habitat, climate change, disease (in North America white nose syndrome has killed huge numbers and is still spreading), and hunting for food and medicinal use in Southeast Asia. And Vampire Bats? The species, living in Central and South America, mostly feed on blood from farm animals and birds. And the bite doesn’t kill. The danger comes from the possibility that the bat carries rabies. 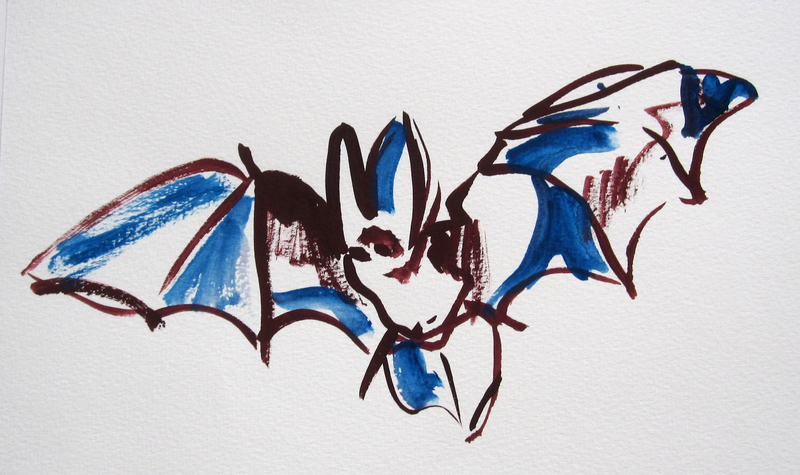 Only a small percentage of bats carry rabies. Raccoons, skunks, foxes, coyotes, and cats and dogs are a much bigger rabies threat to humans, although since the advent of widespread vaccinations for pets, there have been very few cases of human rabies in the United States. You can see my last year’s Halloween bat post here. I held myself back from putting acorns on this. I’m not sure it’s finished but I like the middle square. Running out of wood so I will need to go back to paper soon. 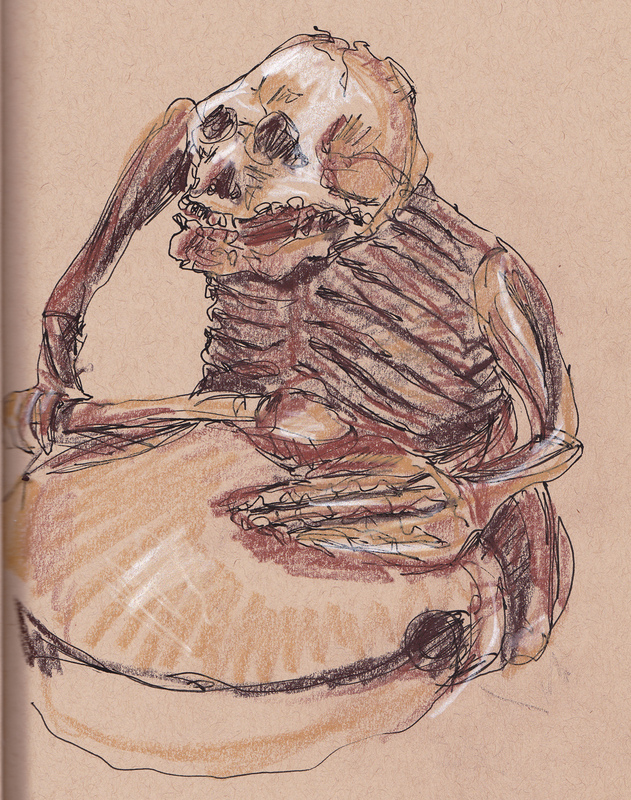 Thought I would start Halloween Week with The Ghost of the Buddhist Priest Danka as a Skeleton banging on his drum. I couldn’t find out much information about the subject, but it seems to be one that is depicted in netsuke fairly frequently. Perhaps keeping other ghosts at bay. Yup, Class of ’65, Eastside High School, Paterson NJ. My grammar school PS 20 had the largest representation at the event and they even snapped a picture. I did a little sketch of the group pic but only painted myself in and sketched the rest. Just lazy I guess. 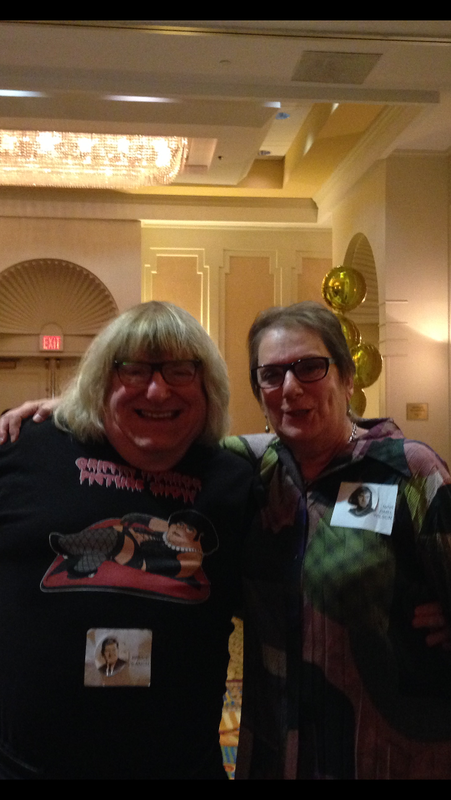 Here is a shot of me with my famous classmate Bruce Vilanch. He was on Hollywood Squares and is a comedy writer. He told me he thought I was pretty funny in high school. All in all it was great seeing people that date back to Kindergarten. A couple of friends told me they still had photographs by my dad, a portrait and his famous Great Falls photo. That warmed my heart. We all seem to be going strong! 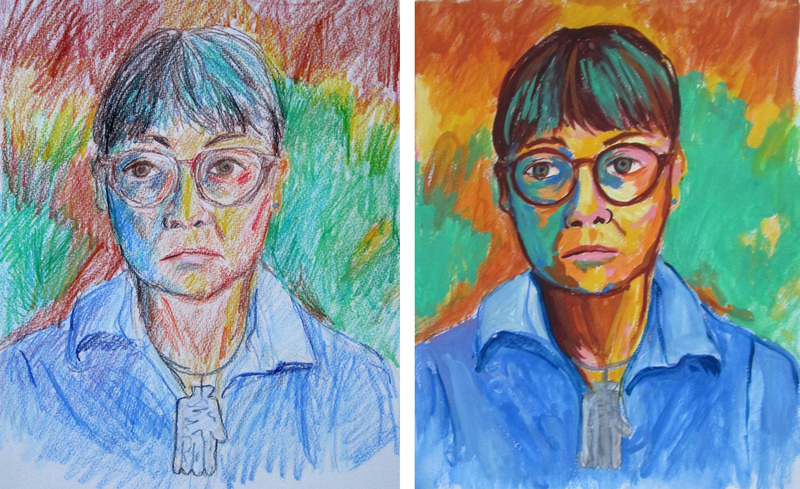 I struggled with this one, but it turned out to be an interesting exercise, if not one of my favorite self-portraits in the end. 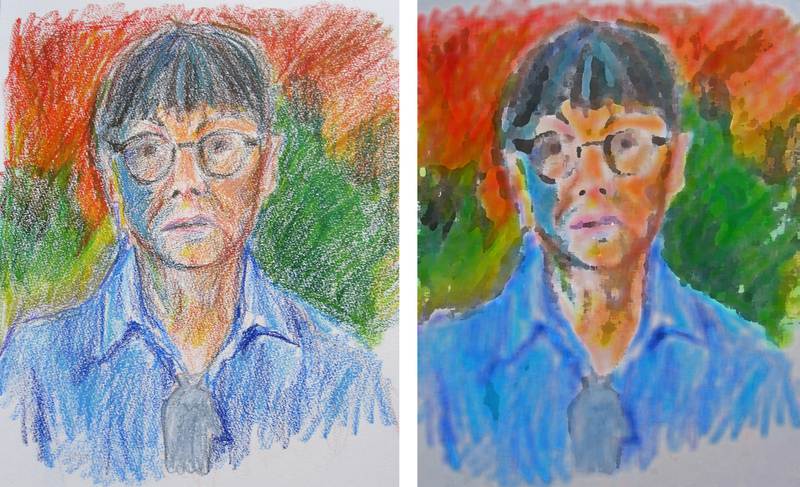 My first thought was to do the portrait in neo color crayons, as that was what I used in my long-ago and less colorful first attempt (below) at the style of this portrait used. But it seemed too timid. So then, borrowing from Cynthia at Sand Salt Moon and her photoshop renderings of her drawing and painting, I scanned in the portrait and tried a few filters on it. I intensified the colors and added brush strokes: better, but still not what I had in mind. 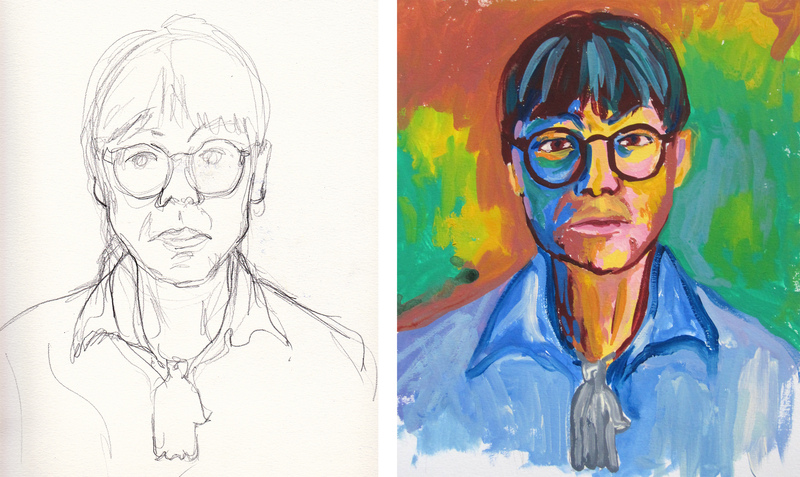 I had also wanted another focal point to the face (Matisse had his pipe), so I wore the hand amulet that Nina gave me. I did this first neo color version of #7 in my blue shirt and amulet totally in front of the mirror, as I had done with the original attempt above in 2014. OK, I needed paint to get the effect I wanted. 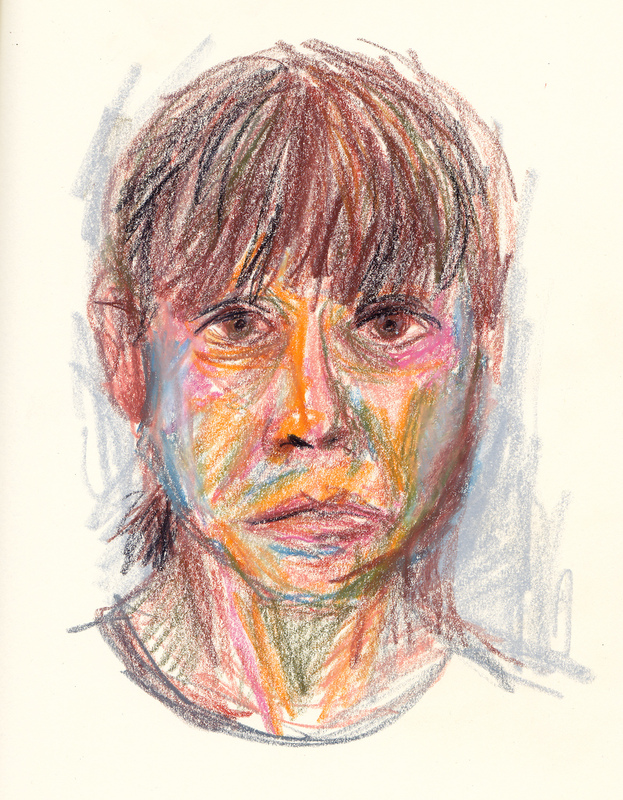 I did a pencil sketch in front of the mirror, and then painted it at my drawing table. Wow, I look like my mother in this one. One thing that really stands out for me in doing this project is the need to let go of some ideal image we need to reproduce. The mirror lies, photos distort, and we (and everything else) look different depending on time, place, and situation. So an “exact reproduction” is impossible. I remembered that I had wanted to do a colored pencil drawing in front of the mirror and then paint over it, so that’s what I did for my final portrait based on this Matisse self portrait. Can you tell it was the end of a long day and I was tired and feeling somewhat down? But I think this technique works well for doing a painting, and I’ll definitely use it again. I actually don’t know which version I like best. But it’s time for another painter. I have a few in mind for #8.